In my researches into the Tulbowitz family, I came across the well-documented work by Dave Howard, a descendant of the Gurwitz family of Rezekne who has done a great deal to discover and publish information on our ancestral town. 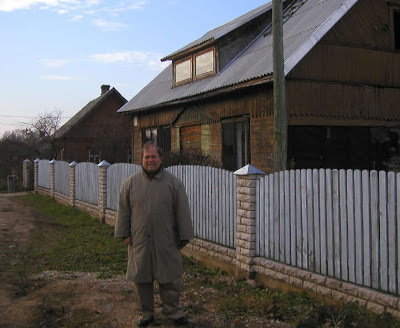 The photo shows Dave on one of the residential streets in the old Jewish part of Rezekne. We've been in touch several times in the last few weeks, with the result that he plans to include our Tulbowitz information in the JewishGen ShtetLink for Rezekne that he is currently compiling. Until that is ready, here is Dave's Rezekne page on his FamRoots.org site. Much of what we will see when we visit Latvia next year is already available for view on these pages. Thanks, Dave.